All relationships are very intense right now, and you are experiencing a depth of love that can make this Christmas very special and memorable. You need to make an effort to be more easy-going as you may not appreciate that you are being quite demanding and are putting others under pressure. Your very intensity may actually alienate others and make them back off, and so make sure you are measured in your responses. Pride and blindness to the obvious can hinder you, and so you need to take a step back and look beyond your immediate horizons. This is a time when you can be very successful in achieving personal goals and influencing others as long as the goals are not ego driven, but driven from the perspective of creating awareness and positive externalities for all. Group efforts and goals that take society forward regarding education or inspiration will be the most successful. This month is ideal for puzzle solving, computer games and mental games like chess, and so if you compete online or even play poker for fun or more competitively, you can do very well. 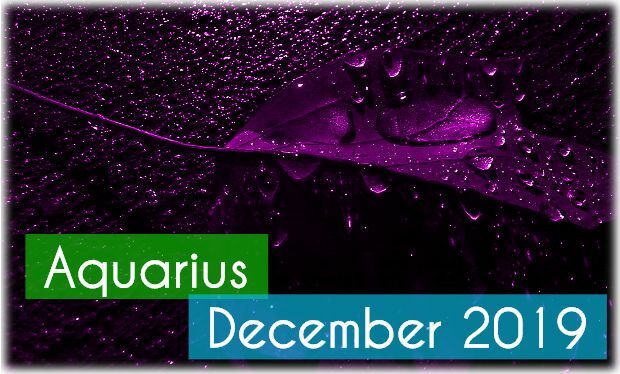 Aquarians are very good at recognising patterns whether these be patterns of behaviour, consumer trends or mathematical patterns, and you can use this to advantage in business or your personal life. You end the year on a positive note, and you are excited about the new plans you have in the pipeline – you should, however, wait for the new year to launch anything, as many finishing touches are needed. A very good time for all relationships new and old. The spiritual side of relationships is very important to you, and so deeper connection matters more than traditional compatibility. Thus ‘odd couple’ relationships that are unconventional can do very well right now as external things matter less. In new relationships, you may find that you are attracted to someone who fulfils none of your usual criteria; in fact, your relationship rule book may go right out of the window. Inner strength is very important to you, and you may be able to draw more confidence from your new partner’s strength. You are very sensitive to your partner’s needs and can sense things before they even say – which mean you could be very good at anticipating idea Christmas gifts. On a more serious note, you can be more touchy than usual and you should not overreact to things that are imagined not real. While you are attuned to subtle signals, you need to be able to distinguish between ‘signs’ that are real and those which are merely the product of an overactive imagination. A very successful time for all those of you who analyse human or social behaviour – psychologists, counsellors and any person who studies or researches in related fields can make breakthroughs in thinking and may even come up with new theories that can take your field by storm. Many Aquarians may develop an interest in psychology and may decide to become more au fait with psychological theory to make use of it within your career. Industrial psychology is a field of special interest to Aquarians. You will see to understand human nature and motivation better or to be a better boss, better manager or a better leader. You may also learn more about subliminal messages and how to use non-verbal forms of communication, i.e., body language, colour or voice tone to improve the way you deliver your message. A good time for backroom investigations and top secret decisions – this is not the best time to go to the press with information unless you are whistle blowing. Business-wise, you should play your cards close to your chest and ensure that competitors do not get hold of any of your promotional or price strategies. Industrial espionage can be a problem, and so make sure all your data is protected. It is very important not to become associated with insider trading or divulging confidential information in any way. Steer clear of any person who may do this – do not be guilty by association.